For most of us, New Year's is a day for resolutions. 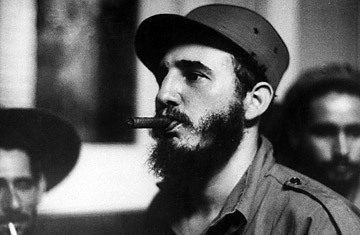 But for Fidel Castro, it marked the culmination of a long-awaited revolution. Fifty years ago on Jan. 1, Castro's Communist revolution swept aside the hated Batista regime. The change was bad news for the U.S.; Castro's regime (and American attempts to eliminated it) prompted the Bay of Pigs debacle, closed off a beautiful country with a vibrant music culture, and  possibly worst of all  triggered a 46-year-old trade embargo that has deprived Americans of Cuba's most prized export: its vaunted cigars. Though Cuban cigars are perhaps the world's most revered, the stogie probably didn't originate on the island. Cigar smoking first took hold elsewhere in the Americasexactly where and when remains uncertain. A ceramic pot discovered in Guatemala that dates at least as far back as the 10th century depicts a Mayan puffing on tobacco leaves bound up with string. (The Mayans may also have handed down the object's name: their term for smoking, sikar, likely led to the Spanish cigarro, from which the cigar takes its name.) When Columbus stumbled upon the Americas in 1492, he also discovered tobacco; the New World's natives smoked cylindrical bundles of twisted tobacco leaves wrapped in dried palm or corn husks. Cuba's fertile land and favorable climate allowed all three types of tobacco leaves used in a cigar  the wrapper, filler and binder  to be harvested on the island, and sailing ships were soon distributing Cuban tobacco from Europe to Asia. Columbus had claimed Cuba for Spain, and the Spanish soon cornered the nascent industry, mandating in the 17th century that all tobacco for export be registered in Seville; they later tightened their stranglehold on the market by forbidding Cuban growers to sell the crop to anyone but them  a monopoly that persisted until 1817. By then, cigars were exploding in popularity around the world. The U.S. consumed some 300 million cigars by the mid-19th century, and many Cuban cigar-makers migrated to nearby Florida, where Tampa became known as "Cigar City" by the early 20th century. "If I cannot smoke in heaven, then I shall not go," Mark Twain declared. Though the boom was partly lit by the cigar's affordability, they soon become a must-have accessory for debonair gentlemen  men like King Edward VII, who, upon assuming the British throne in 1901, famously announced a break with the smoke-free policies of his mother Queen Victoria by uttering the words: "Gentlemen, you may smoke." Ulysses S. Grant's cigar habit proved his undoing, saddling him with the throat cancer that killed him. And Freud was a chimney: Patients on his couch had to endure not only running commentary about their suppressed Oedipal complexes but the acrid stench from his 20-a-day cigar habit (which ultimately killed him too). Despite the obvious health risks, cigars remain a fixture of pop culture. An episode of Seinfeld centered around a box of Cubans, while the stogie's famous champions include Michael Jordan, Rush Limbaugh and Lil' Wayne. Politicians dabble too  Arnold Schwarzenegger is a noted fan  although puffing on a Cuban can leave an eggy residue on a pol's face. A year after Tom DeLay thundered that "American consumers will get their fine cigars and their cheap sugar, but at the cost of our national honor," a photo emerged of the former House majority leader sucking on a Hoyo de Monterrey. Washington was also the site of the cigar's most infamous moment: its use as a sexual prop by former President Bill Clinton during a tryst with Monica Lewinsky. Yet Washington is where cigar-lovers looking to enjoy a smooth Cohiba or Romeo y Julieta  without skirting the law  can look for hope. President-elect Barack Obama has indicated a willingness to discuss with Raul Castro the repeal of bans on Cuban-American travel and remittancesgestures that could ultimately lead to scrapping the trade embargo. For aficionados, that would be a welcome tonic for the grim times ahead. As Evelyn Waugh said, "The most futile and disastrous day seems well spent when it is reviewed through the blue, fragrant smoke of a Havana cigar."